Everyday our kids make different choices that can greatly affect their lives. What snacks to eat? What clothes to wear? Who to play with? How to stand up to bullies? No matter how simple or difficult the decisions are, it is our responsibility to train our kids to make positive and appropriate choices at all times. By empowering them, our kids will grow up having a great sense of control and better understanding of their own needs. School is one of the venues where our children can put their decision making skills to test. To enhance their problem-solving skills and help them come up with smart decisions, it is important to know the different crossroads that our kids are facing. By knowing the life changing decisions they make at school, we can gear them up and help them assess every option available to them and foresee the consequences of the choices that they will make. It is important to help our kids choose their school peers carefully and wisely because their friends will have a great influence on them. It will affect not just their academic interests but also their outlooks in life. Start with showing them that good friends will always bring out the best in them. Be a role model and let them realize that good friends are there to celebrate their achievements and to support them during the hard times. School is a good training ground for future leaders. But much more, it offers an opportunity to practice their ability to wisely choose their leaders. Whether it would be voting for the class president or voting for the student council head, these choices help our kids identify the qualities that good leaders should have. We may not see its effects at the moment, but their ability to choose the best leaders will come in handy when it is their time to stand in the election polls and direct our country’s future. Time management is one of the most important skills that our students need to learn and master. Mostly torn with the decisions of finishing their school projects or playing computer games with their friends, school children can save themselves from the troubles of having poor academic performance if they know how to prioritize their activities and effectively manage their time. Helping them develop a master schedule is a good start. Encourage your kids to block hours for their homework and other school projects. Be there for them when they need your help. Eliminate distractions by setting up a quiet area in the house where they can focus on their school works. Above all, reward them as soon as you see improvements in their school scores. This morning while cleaning my son’s bedroom, I saw a handful of bills rolled inside his school bag. When I asked him about this, he answered that those were his savings. He continued by telling me that instead of buying morning snacks at the cafeteria, he makes sure that he eats a lot at breakfast so he can save some money and buy the new basketball shoes he saw at the nearby mall. The story shows that even at a young age, our children have the opportunities to save money. The challenge to help them make the best decision is now up to us. Sit down with them and discuss how you can help them save more from their daily allowance. Be more involved. Prepare packed lunches and snacks for them so they will have more opportunity to spend less at school. Bullying remains one of the biggest problems that our kids face at school. Teaching your kids how to deal with bullies is important as this will greatly impact their life. Among the tips that we can share to them is to avoid a run-in with the school bully. 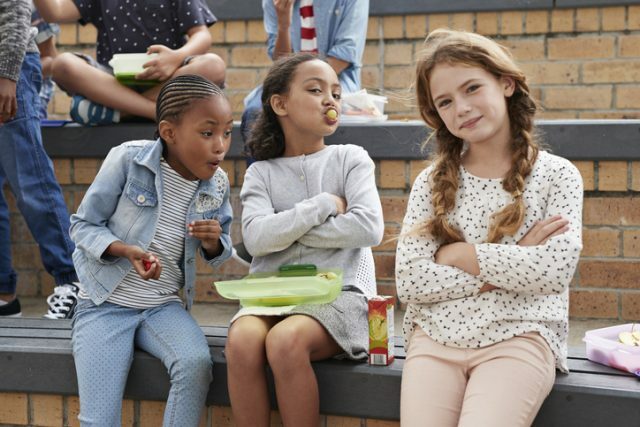 Of course skipping class or hiding is not an option, but taking a route that is different or far from the school bully will save them the trouble. Encouraging them to always have a friend with them is also a big help. Above all, boosting their self confidence is essential that if ever they had a run-in with the bully, we know that they will be brave enough to stand up to him.